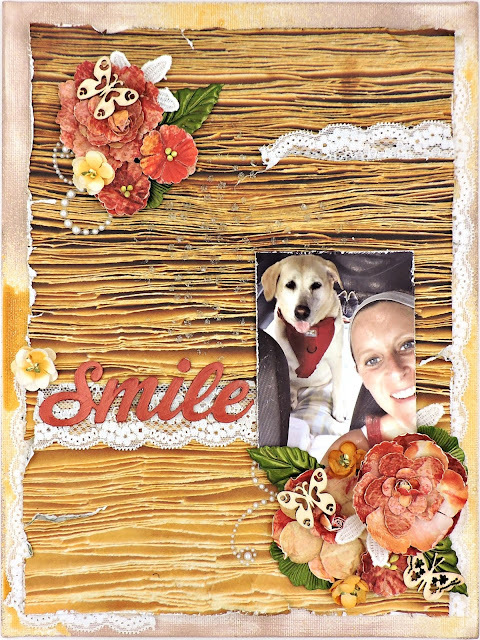 It's my turn to post a project for the July Round Robin at Swirlydoos, following Linda's heartfelt tribute to her sweet dog, Harley and Hege's beautiful lift featuring her son's friendship with their neighbor's pet. Like Hege, I borrowed a dog - the awesome Mookie, seen here with my niece on their way home from an afternoon spent splashing in a dog-only pond (how cool is that?!). I kept very close to Linda's original design, adding a lot of Hege's touches to my layout. However, something told me to use a 9 x 12 canvas board as my base with one of the papers from the July kit - I just love the pattern of this piece! I sprayed my canvas with Irresistable mist in Desert Sand in random spots and when it was dry, I applied Distress Ink in Walnut Stain all around the edges. Meanwhile, I heavily distressed the pattern paper and I applied Texture Paste in White Sand through a Prima stencil #960162 in the center to look like water splashes. The lace is from Kim - some of the pretties that she gave out at Swirly Camp for her canvas class. I've had these flowers for several years - time to let go, right? The leaves are metals that I ordered on EBay (another thanks to Kim for sharing this seller). I've colored them with Prima Metallique paint in Green Olive. I've also lifted Linda's title - cut on my Cameo and colored with Prima Metallique paint in Rusty Red. Lots of thanks to the 2 ladies for some wonderful inspiration and such remarkable road maps to follow.